Last week, I wrote a post about word games like Scrabble that friends can play with each other online. But for those who want to practice on their own at home, or for teachers who can display a computer monitor on a projector or has a SmartBoard, there are some addictive online games. 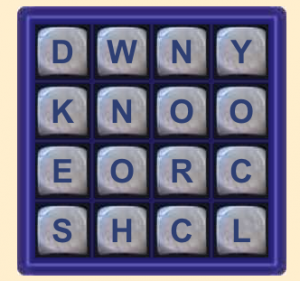 Boggle, the classic word-scramble game, can also be played online. And another similar one on East of the Web called Eight because you play with eight letters. What online word games do you like best? Send suggestions!